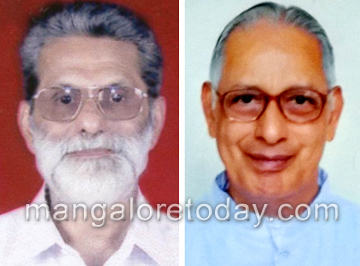 Mangaluru, Nov 1, 2015: A pall of gloom and sadness engulfed the catholic community this evening as the tragic news of a road accident in which two retired priests of Vianny Home Kankanady, Rev. Maxim Furtado (74) and Rev. John D’Souza (73), were killed, and Fr Joseph Martis, rector of St Joseph Seminary, Jeppu, driving the vehicle was injured and is in hospital. Preliminary reports say that the priests were on their way to Kulur church to take part in mass on the occasion of the birthday of parish priest Fr Harold D’Souza, it seems a gas tanker hit their vehicle near Kottara Chowki. Rev Maxim and Rev John were declared dead at the hospital. It is known that Rev Maxim E Furtado, from Madanthyar, born on November 19, 1941, and Rev John D’Souza born on April 22, 1942, were ordained on the same day, September 27, 1967, and as senior retired priets were living in retirement, they have served the community and region in exemplary ways. The concern and prayer of the people of the city now is palpable.